All levels of fiddlers, guitarists, banjo players, percussionists, and other instrumentalists and singers may attend scheduled workshops and jam in spontaneous groups throughout the weekend. Those who wish to perform may do so at the Saturday night concert. Even if you think you have no talent, but love to listen to great music, you want to come on up and enjoy our comfortable facilities, great food, wonderful ambiance and hear great sounds from morning ’til night. Seldom will you find such a gathering of elevated talent as that which assembles on this crisp fall weekend at 6,800 fee above sea level. Sing play, jam and dance, all day and into the night. Meet musicians and singer for all over California and beyond. 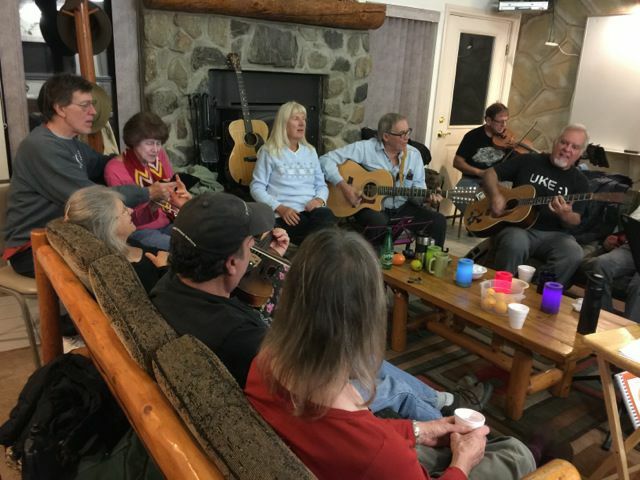 Music in the Mountains is sure to enhance the artistic soul of each and every person who attends. Our headliner this year is guitarist and mandolinist, Mike Mullins. 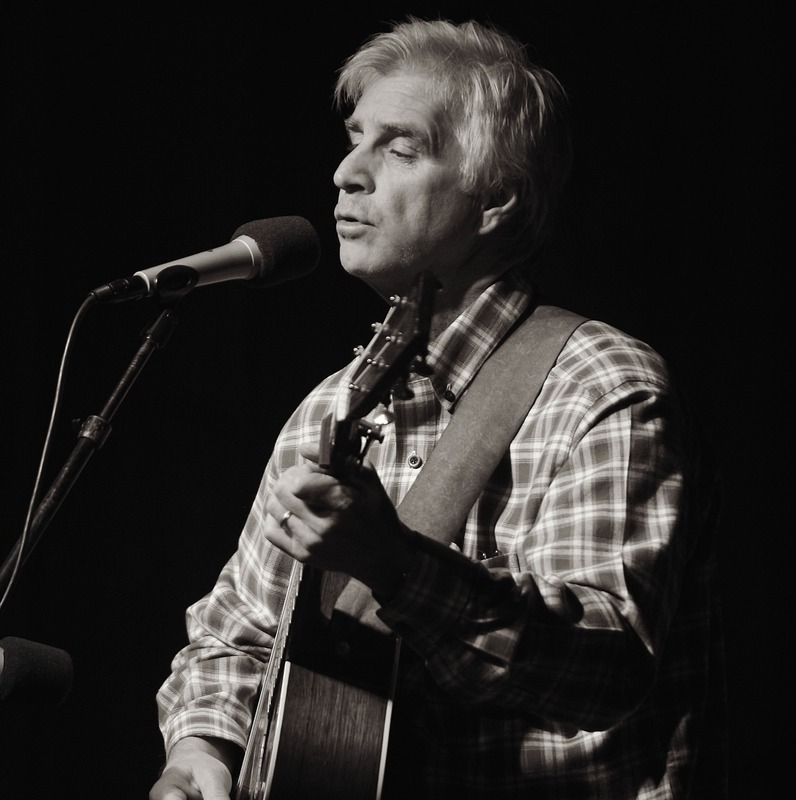 Mike has been a respected fixture in the California acoustic music scene for over 40 years. In addition to the Hay Dudes, he has toured or recorded with renowned fiddlers Phil Salazar and Byron Berline, The Acousticats, The Tom Corbett Trio, banjoist John McEuen, songwriter Penny Nichols, multi-instrumentalist Joe Craven and is a current member of The Cache Valley Drifters. He has con tributed to over 100 recordings, and in November of 2014 released his first solo project, “Windows of Time,” a compendium of guitar and mandolin Americana styles showcasing his original material over a 25-year span. 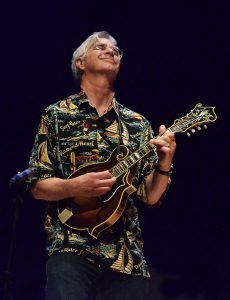 In addition to acclaim as a solo artist, Mike is widely regarded as a top-tier mandolinist and for multiple summers as an artist-in-residence at The Annual Mandolin Symposium hosted by David Grisman and Mike Marshall. Mike is currently at work on 8-String sketches,” a collection of solo mandolin arrangements of music from around the world. Click here to read more about Mike. This amazing weekend is so reasonably priced that you can hardly justify staying home! Lodging and six delicious meals are included in the registration price, and you won’t have to life a finger, expect perhaps to pluck the strings of your instrument ( and maybe to set up and bus tables). This is our most reasonably priced adult camp at de Benneville Pines. Should you want to arrive at camp on Thursday evening, that option is available for an additional $20 per person. If you choose this option, please be prepared to bring food for dinner on Thursday and breakfast and lunch on Friday. The first meal served will be dinner on Friday night. Please be sure to check the appropriate box on the registration page! Craig’s Cabin is being used by the event organizing team and is not available for camper use. Housing upgrade requests will be considered on a “first come, first served” basis. However, couples’ requests for double beds in Cabins 5, 7 and 8 will be given priority over unaccompanied single persons making the same request. Due to scarcity, not all requests can be fulfilled, so if you have special accommodations needs, please register early. We prefer that you register online for this event by clicking on the button below. A $75 per person non-refundable security deposit is required for all registrations. Your registration will not be considered confirmed until the security deposit has been received. Payment in full must be received by no later than October 24, 2019. We do NOT accept payment at Check-in. Our thanks to the LA Song Makers for programming the weekend with wonderful workshops.